Next to my dry cleaner in a small strip shopping center is a little family-owned jewelry store that I occasionally patronize to replace a watch battery or repair broken chains. The merchandise is lovely, and there is nothing unusual about this neighborhood store except that prominently displayed behind the counter is a Trump/Pence bumper sticker. The owner’s decision to reveal their political preference would not be worth discussing if the store were situated in a red state, in a red county — but it’s the polar opposite. The store is located in Florida, the nation’s largest battleground state, in the second largest county where there are only 249,997 registered Republican voters compared to 587,015 registered Democrats. The county’s Supervisor of Elections website lists 325,391 NPA’s (non-party affiliated) which means that out of 1,169,453 registered voters — only 21 percent are registered Republicans. Thus, it’s no surprise that in 2016, Hillary Clinton won the county with 66 percent of the vote compared to 31 percent for Donald Trump. Despite Trump’s trouncing in the county, he still won Florida by 1.2 percent adding 29 electoral votes that were pivotal to his 306 total. But, from the metric of Republican voter registration, my local jewelry store sits in extremely hostile political territory. Last week when my favorite gold chain needed a new clasp, I found myself at the jewelry store counter. During the transaction, my eyes were once again drawn to the Trump/Pence bumper sticker. My visit occurred just as the nation was gripped by the Judge Kavanaugh Supreme Court hearings with the outcome still very much in doubt. That day’s intense political climate led to a discussion with one of the owners about how the nation appeared to be in the midst of an “uncivil war.” During our chat, I revealed that I too was a Republican as we commiserated about how the left was set on destroying a good man with no hard evidence. We agreed that Kavanaugh had become the national symbol for all aggrieved women who had experienced sexual assault. Then I walked out and entered the dry cleaner next door. After retrieving my clothes, I felt compelled to step back into the jewelry store and offer the owner some friendly heartfelt advice. “Remove that bumper sticker” I stated, explaining how the 2020 presidential election was starting the day after the midterm election and the nation could become even more unhinged than it was today. “Your store could even be in danger,” I warned. Joan the co-owner (not her real name) appreciated my concern for her store’s well-being. She said that I was not the first person to make such a suggestion, but adamantly disagreed with my advice. I found her reasoning inspiring, brave, and uniquely American. She told me that the bumper sticker was a holdover from the 2016 presidential election when three bumper stickers adorned the small store. After Trump was elected president her family was so elated that they decided to keep displaying only one sticker. Joan explained that they know the store “runs a risk” but they “want to fight back” and displaying a Trump/Pence bumper sticker is her family’s weapon of choice. 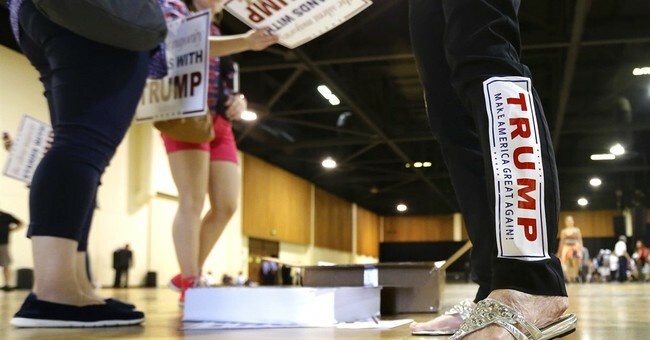 Listening to Joan, I started to feel small after suggesting that they surrender the bumper sticker for the sake of the all-mighty dollar after recognizing that she and her family were doing nothing more than overtly showing support for President Trump. Proudly, Joan went on to explain that the bumper sticker helps them “bond with customers who are Trump supporters” adding that “customers always point to the bumper sticker” and use it as a jumping off point to discuss politics with obvious Trump-friendly store owners. Conversely, Joan stated that “she can always tell when customers don’t like the sign,” but does not think it has hurt their business. In fact, it’s the opposite. She offered that the Trump/Pence sticker actually “increases sales with Trump supporters” and definitely “helps more than it hurts.” Joan and her family actively “want customers to know” that they are Trump supporters. Joan also thinks that if Hillary had been elected in 2016, she “would have destroyed the nation.” Her family was elated when Trump won because they believed he supported small business and was a Christian like them. “Thank God he won,” she added. Joan is adamant about displaying support for Trump in a space that she and her family control, but outside, recognizes that personal safety trumps support for Trump. Last week, an errand to the local jewelry store resulted in my experiencing “a slice of political life” in what I consider to be the “Divided States of America.” I learned how proudly displaying a two-year-old bumper sticker has become a symbol for “fighting back,” while accepting and avoiding the potential for physical danger that same bumper sticker poses on an actual bumper. Such a dichotomy speaks volumes about where we are as a nation. Moreover, because of potential retribution, the fact that I cannot reveal the store name or where it is located, speaks even louder.